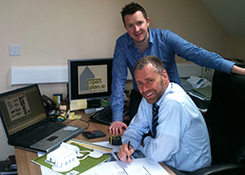 Openplan Architectural Design is a design–led architectural practice based in Tralee, Co. Kerry. We provide an innovative, high quality, reliable and cost-effective professional service in architectural design and planning for private houses, extensions & refurbishment works. Our approach to all projects, regardless of scale or budget, is to gain a clear understanding of the objectives and vision of our clients. We invest time and energy collaborating with our clients and any necessary specialists to identify opportunities and explore a range of options available to arrive at the optimum solution to satisfy your requirements. Openplan Architectural Design can offer you a "one-stop" service catering for all your needs from concept design and planning permission to occupation. We have a multi-disciplinary team available to provide you with architectural, engineering, cost analysis and project management solutions appropriate to your needs. Our mission at Openplan Architectural Design is a sustained commitment to good architecture. We recognise that achieving this mission means being fully aware of the needs of each client and consistently providing a high quality service. Fundamental to our approach is the belief that the optimum solution is often the simplest. This has resulted in projects that have clear, legible and efficient designs whilst at the same time are exciting, innovative and give our clients years of enjoyment with their families.